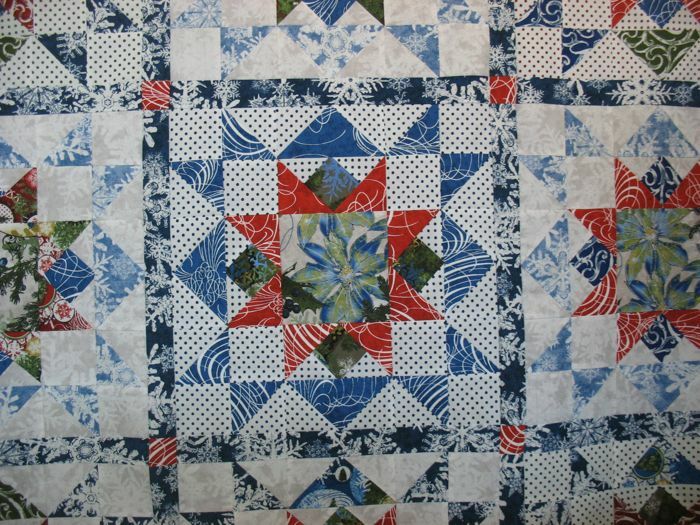 May | 2010 | OccasionalPiece--Quilt! 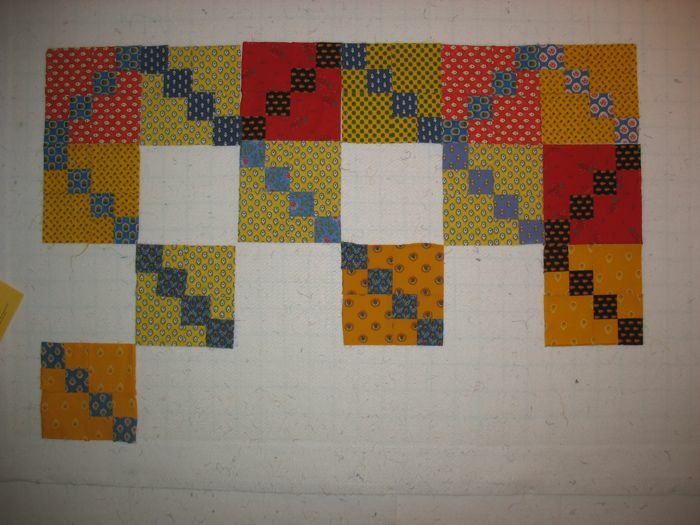 Posted on May 31, 2010 by Elizabeth E.
The quilt is now at the cellular level, meaning that not only I have ripped the quilt into many blocks, I’ve now taken the blocks apart into their pieces. Daunting? Oh, yeah. Am I discouraged? Pretty much–but mostly because I can’t figure out how to make a quilt out of this fabric that I think I will be happy with. Traditional French “Indienne” fabric is printed with little designs in an ordered fashion: polka dots, if you will. 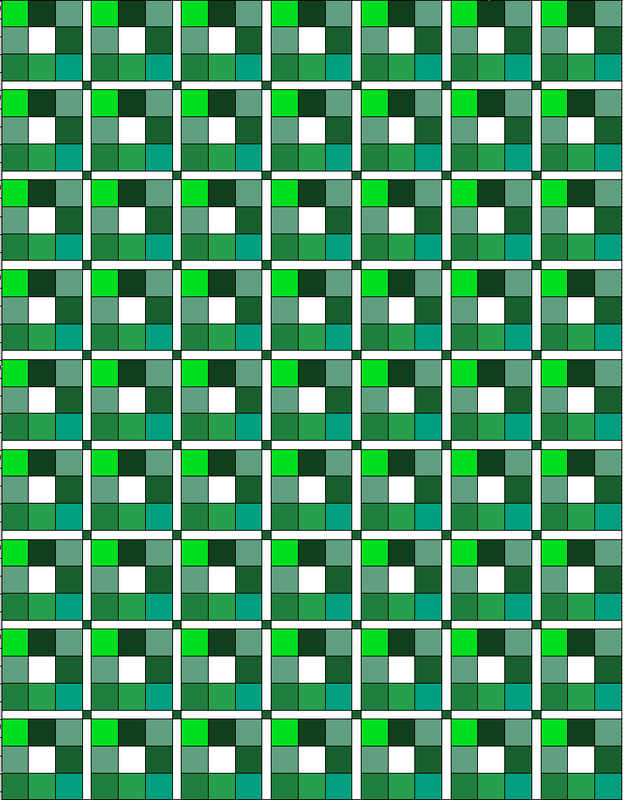 (Click on the photo above to enlarge to see the designs more clearly.) 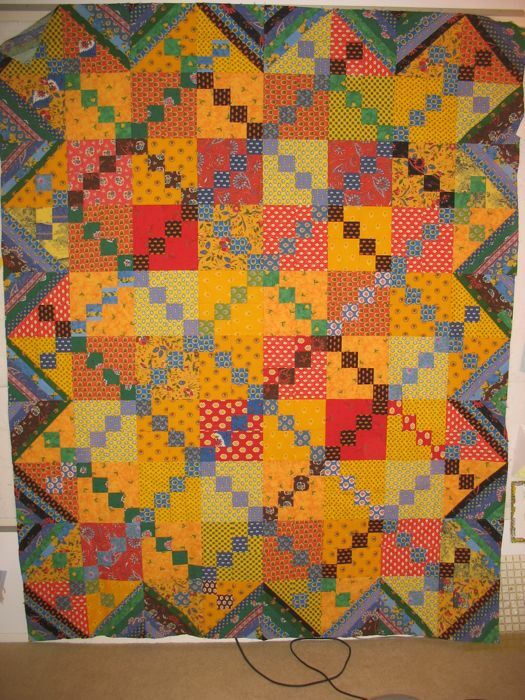 And if you’re going to make a quilt out of polka dots, usually it’s the broad strokes of color that will be seen, as in the photo below, where you notice the red squares against the yellow squares. I was despairing that I didn’t have enough red fabric to complete my current idea and Lo and Behold my friend Tracy brought me a fat quarter of some “real French fabric” today from her trip to Spring Quilt Market. What serendipity! Frankly, I’m feeling a little dotty. Time to let it rest. So here’s a change of subject. 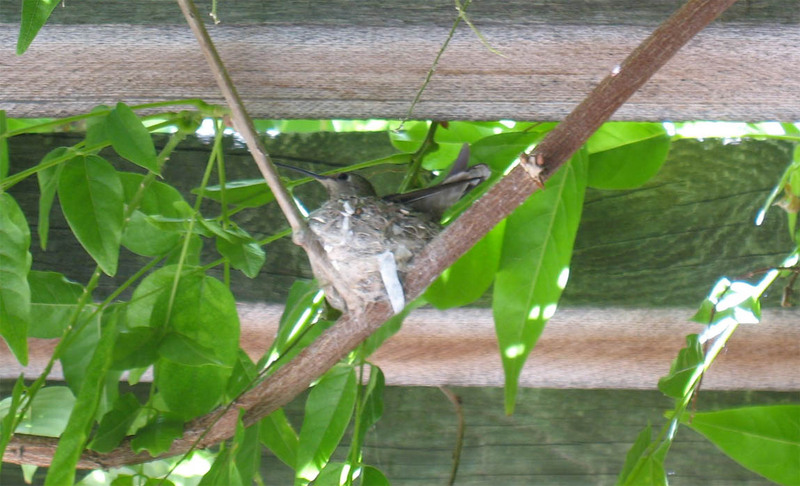 In our arbor out back, where some of the vines have looped down underneath, a hummingbird has built her nest. She’s about 8 feet from our family room window and we brought down the binoculars to watch her up close. Riley and Keagan had a fun time seeing her on the nest (although the functional use of the binoculars was a bit out of reach for them). That bird just stayed there and stayed there and stayed there. Once when she finally flew off (to get some food, we assume) Barbara made the comment that she understood perfectly: even the most diligent mothers need a break now and again. Well now we think the eggs have hatched for the bird flies away far more often, then dips her beak down into her nest when she returns. No sign of the baby birds, though. 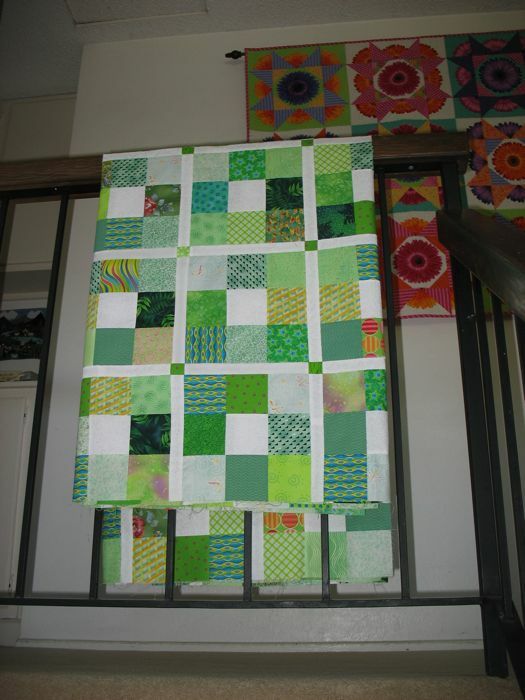 Posted on May 27, 2010 by Elizabeth E.
I finished the green quilt top, stitched together the pieces for the back and it’s now at the quilter’s. 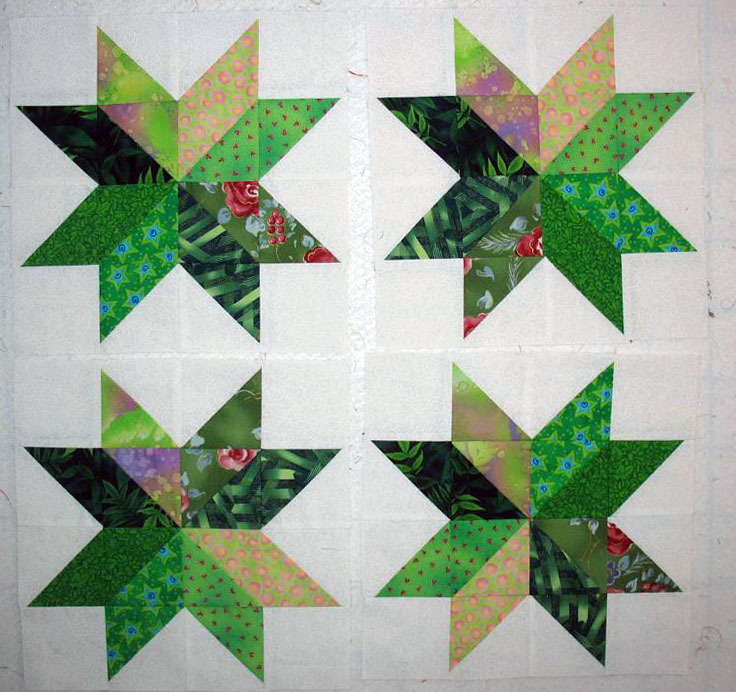 I began this one–Christmas Star–last fall (November? October?) in a clear space in my schedule, but it’s taken me until now to finish the top. 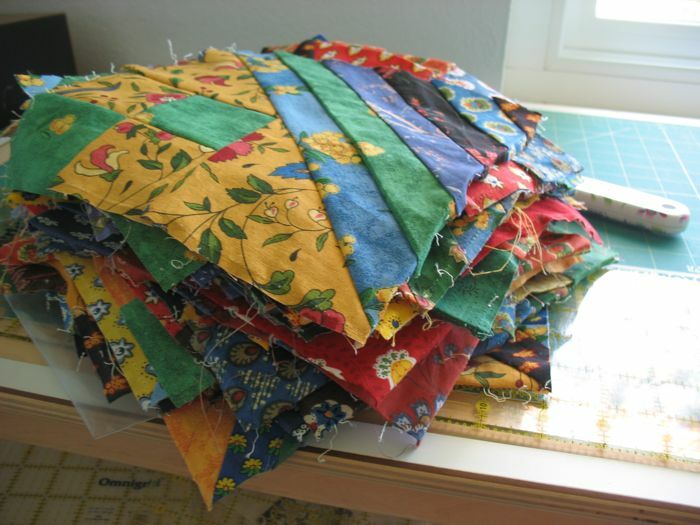 Today’s goal is to get the back pieced and get that off to the quilter as well. 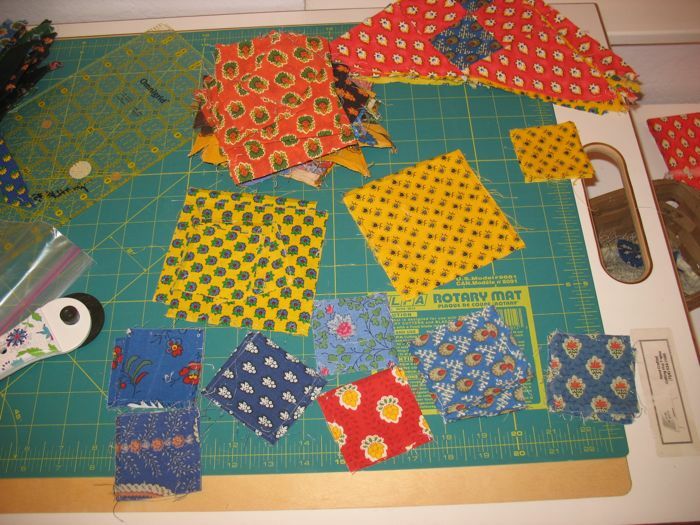 I’ve even begun thinking about the other quilts marooned in my quilting closet, those quilts that I bought the fabric for, dreamed up and abandoned for work or family fun. Maybe I can even tackle one or two of those? Don’t want to get too giddy, now. 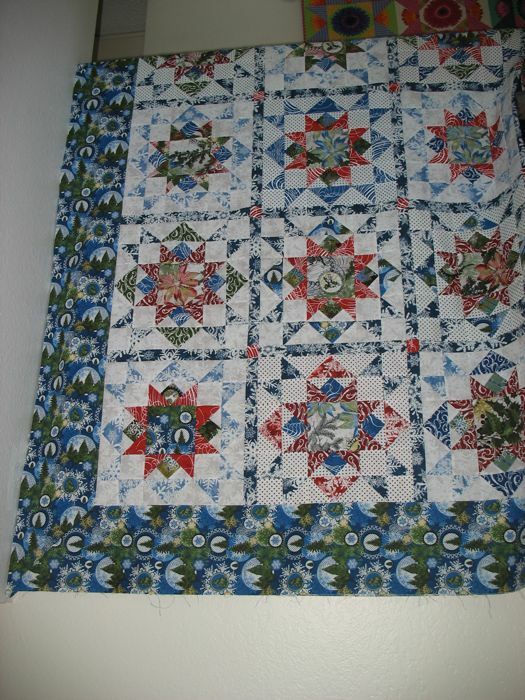 For those of you who asked about the quilt in the background, it was last summer’s project.